Dr. Boehnert has produced 3 intersting charts on Climate Change and as stated, they are still a work in progress. The top chart does show how the USA has tried to discredit the science behnd climate change. And more recently how the UK Government scrapped the Sustainable Development Commission: http://www.sd-commission.org.uk/ and has made large cuts to the Environment Agency. relationships between climate discourses, prominent actors and major organizations participating in climate communication including science institutions, academic institutions, media organizations, think tanks and government agencies – along with the interests and funders linked to these organizations. Various discourses are mapped including climate science; counter-movements (contrarianism); ecological modernization, neoliberalism and corporate capture; and social movements (climate justice). 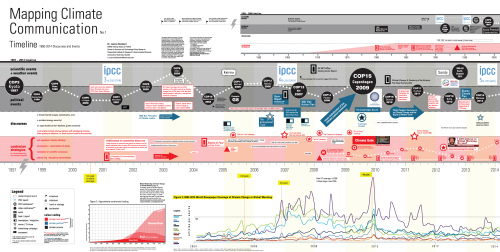 The timeline visualizes the historical processes that have lead to the growth of various ways of communicating climate change. The network visualization illustrates relationships between actors and prominent discourses. The strategy map displays methods used within four discursive realms. More on the Bedroom Tax and the Governments mis-information.